The new weighing module PLH1 was especially developed for the load cell SM63 and offers a cheap and simple solution to integrate weighing systems into large tanks and silos. The PHL1 provides excellent load introduction while maintaining the maximum possible freedom of movement eliminating problems due to mechanical and temperature related expansions. The standard version of this compact mount includes integrated lift off prevention which also limits lateral movement. The mount provides a high level of restoring forces due to the different radii used inside the hardened, polished cups of the mount compared to the spherical domed loading areas of the load cell. This ensures that the load is always brought back to the central position. 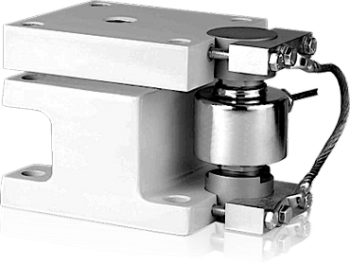 The pre-assembled weigh module can be installed with or without a load cell, prior to final commissioning. If the load cell is not installed, this minimises the risk of damage due to nearby welding. The earth strap fitted to the mount as standard, together with an optional surge protection circuit can prevent damage to the load cell, junction box and associated electronics due to static electricity or even a lightening strike.